Just thought I would share a video tutorial I created a while back showing how to use Make the Cut to take a normal flat cutting file and turn it into a really unique shaped greeting card. I've used this technique many times to make a custom card for someone so I can give them something that is really personal. 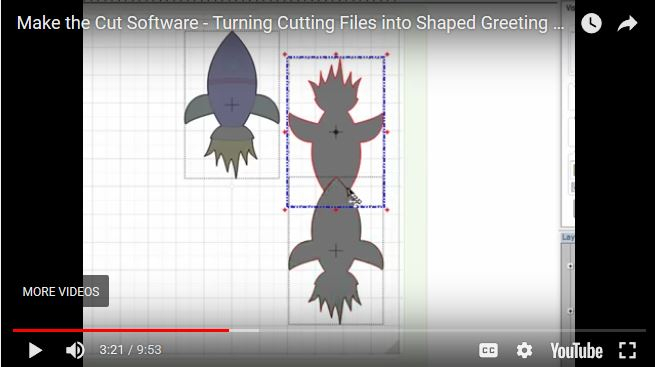 If you're a Cricut or Silhouette user, once you've created the file you can export it as SVG to import into other software for cutting. Clicking the image will take you to my blog where you can watch the video. Great video, Nancy, well explained. Like the way you did that. Of course being me I would have gone about it differently but I think your way works extremely well. Also your explanation is brilliant.